This room -- Pretty much, to me, a perfect room. It's not quite minimal, not quite glam, with a little rustic thrown in underfoot. It's a kitchen (but doesn't really look like a kitchen...which is sort of my thing.) I love it. L.O.V.E. I.T. 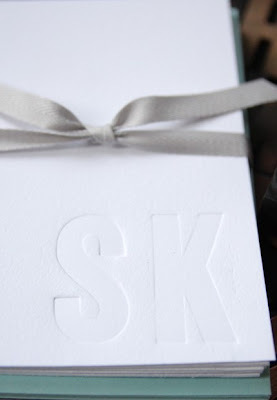 Suann's letterpress -- I've always loved her work, but I'm completely taken with her twist on the monogram in the little stack of cards above. 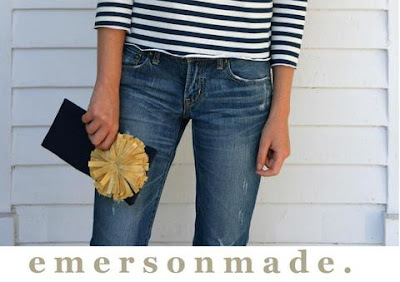 Emersonmade...sigh. Love her stuff so much had to put it on two lists this week. Couldn't help it -- had to be done. 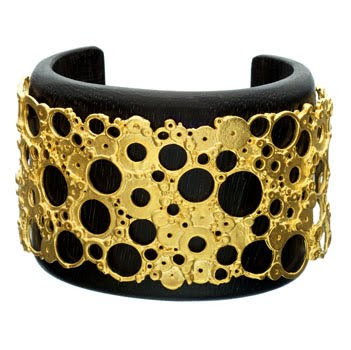 This cuff. Stunning. You'd wear it and wouldn't need a bit more jewelery. Done. 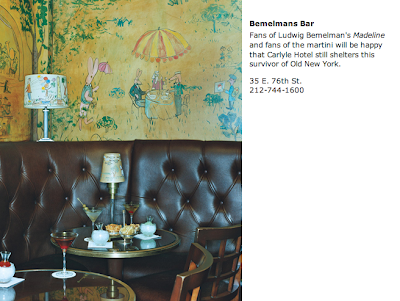 The mural at Bemelman's bar....It's on my list of places to take the girlies (and myself) given our mutual love of Madeline. The fact that my Meyer Lemon finally seems to be bearing fruit...although this lemon was dark green for a long, long time, so I'm wondering if it's a bust?? Anyone have experience with a Meyer Lemon? How long does it take for the fruit to turn? In other news, Audrey has the day off school today, so I took a vacation day, and we have a full line-up of mother/daughter fun planned, including a lunch date, a movie, a Sprinkles cupcake + a little carnival at the neighborhood library. I'll report back on thee fun tomorrow. I too love Emerson Made. Just purchased the striped shirt and plan on adding a least one flower to my collection. lemons take FOREVER! something like a year from setting fruit to ripe fruit. Our meyer lemon has 3 fruits on it and I think maybe we'll have lemonade by christmas. your lemon looks great! 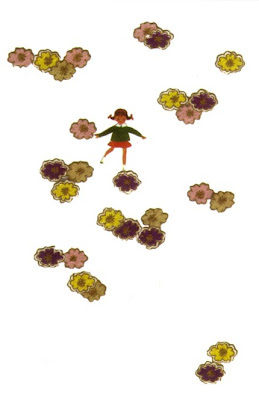 i have a giant tree of them in my backyard, and they all look like that right now. don't worry...it will turn yellow by november when its ripe. What a fabulous kitchen! Thanks for sharing. Have a lovely cupcakes and carnivals type of day. How long did it take from when you GOT the lemon tree for it to actually bear fruit? My husband got me one for my birthday this year and I'm wondering how long I have to expect to wait for actual lemons. Years??? Your mother daughter day sounds so happy. Enjoy your special time. That kitchen KILLS me. Have a beautiful day with your girl. I can see why you love the kitchen so much. The layout is perfect, the floorboards are rustic and perfect and the exposed brick goes so well with the units. Its eclectic without being too much. Its basically just perfect. Ps. This post is very inspiring. My husband loves his Meyer Lemon tree. They do take a long time, about 9 months from flower to the beautful yellow fruit. But it is worth the wait. They are the best lemons! So hang in there. I don't know about lemons, but our orange tree waits until the last moment to change color. By the 12th month it's green yellow orange bam! And I've been advised not to cut them off until they are all orange, or they may taste bitter. 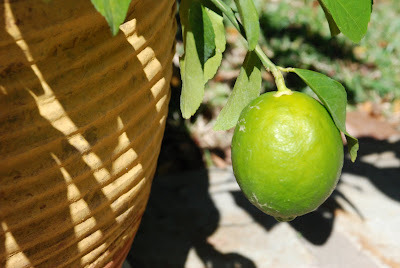 I want a meyer lemon tree now too. Everything you picked is amazing! 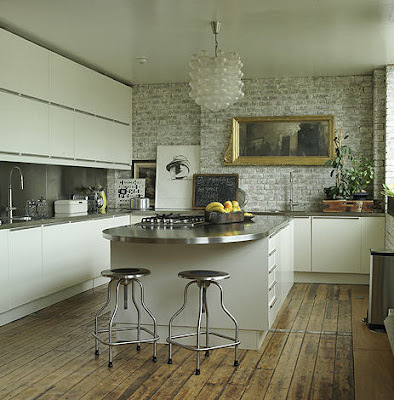 That kitchen is beautiful - the floor and whitewashed brick paired with the sleek cabinets and stainless steel..and a touch of glam with the chandelier... Perfection indeed. Have so much fun with your mother/daughter day :) I loved the little collages! thanks for the blog love! hope you had a good day! so fun. That kitchen is one of my favorites too! I have that in my file of kitchen favs! But I can't remember where I saved it from! So, I'm glad you have the link, I'll have to follow it and see if that is where I got mine. I'm with you on how it is the perfect balance!